The full original size of “Venice at Dusk” aka Church of San Giorgio Maggiore by Twilight aka Crepuscule a Venise was 28.7 x 36.2 in. / 73 x 92 cm. It was painted in Autumn 1908 in Venice where Monet and his wife Alice had traveled by their own chauffeur-driven car. They stayed first at the Palazzo Barbaro and later at the Hotel Brittania. The painting is currently on display at the Bridgestone Museum of Art in Tokyo, Japan. The period during which Monet created this riverscape or seascape painting was when he began losing his eyesight from gray cataracts. Much like van Gogh, suffering seemed to provoke him to do his greatest work. 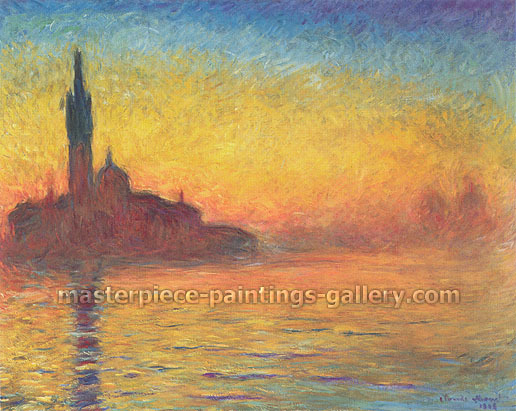 “Venice at Dusk” was one of the first paintings in Monet's “Venice series" which he created until 1912. Like his “water lilies series”, “Japanese bridge series”, and “Thames River series”, Monet completed by memory at his studio in Giverny many of the paintings in this series — a concept he had staunchly opposed until about 1900. In the “Venice series” stone structures and architecture are noticeably sacrificed to light and color. Monet believed nature was a sanctuary from the sadder side of life — particularly commercial development — and he made sure every home he had after the war had a luxurious garden — or he made one. Above is a photo of Claude Monet in 1923-24 on the Rose Path leading to the house in his garden at Giverny. We use only Britain's Winsor and Newton oil paints, the world's premier quality fine art paints. Chinese and other paints are a fraction of the cost but we want your painting to last for a lifetime — and beyond. That's why we also use premium grade commercial canvas. It costs us substantially more than home-made canvas but you get a longer lasting painting. If you have any questions, we'd be pleased to answer them. We have an “Immediate Response Policy”and try to respond to email inquiries as soon as we receive them or at least within 24 hours. Click here to . We will deliver this painting anywhere in the world using UPS, TNT, DPX or DHL courier service. This allows you to track movement of your art online on the courier's web site. When you type your tracking number into the tracking form on the courier's web site you will get a detailed status report. We send you the tracking number by email after the courier picks up the artwork. The canvas for each of our paintings is stretched on a frame during the painting stage. When the painting is sufficiently dry, it is removed from the frame and the face covered with protective paper. It is then rolled and inserted in an extremely sturdy plastic cylinder which is sealed, packaged, and delivered to your door by the courier. We accept all forms of payment, including cash, checks, money orders, money transfer (T/T), and credit or debit cards. Paintings are shipped when personal checks have cleared and electronic transfers have arrived in our account. We might be offering a special deal on one of our completely hand painted masterpiece oil painting reproductions. You can see a complete list by clicking this hyperlink. Memorable Quote: “Selfishness is one of the primary symptoms of insanity! Copyright © 1999-2009 by Masterpiece Paintings Gallery.